My wife hates comics books. It’s really frustrating, but honestly, we have so little in common, and some of that so little is that she just has no interest in them whatsoever. Not just superheroes, either. The whole notion of “books with pictures in them” is anathema to her. What’s really weird is that she LOVES all the comic-based cartoon shows from our youth. Batman The Animated Series, the 1990’s Spider-Man and X-Men cartoons. She to-this-day still likes those shows. She even digs a lot of the movies that come out; she was a big fan of Deadpool and Suicide Squad and Infinity War. But actual comics? Nope. I tried for so long to negotiate some kind of treaty where I would do [X], and she would read a comic book, but for years… no dice. I even bought her the Walking Dead compendium after she had been a big fan of the first few episodes of the show, and she turned her nose up at it. Anyway, she didn’t love it. Anti-climax! Oh my god, but I absolutely love Tim Sale’s art. It’s hyper-stylized and unique, but I think I’d read anything he pencils. I was going to say that I’d like to see him draw every book I read, but I’m not sure that that is necessarily true. Tim Sale is like a special treat you reward yourself with for being good. You can’t have it all of the time because then you’d be spoiled, but when you do get it? Heavens to Betsy, it’s a true delight. Sale’s Joker is what I always want The Joker to look like; it’s so ridiculous and unrealistic, but it’s exactly what the character needs to be. His Two-Face is disgusting and causes you pain to behold. His Catwoman is fluid and beautiful. And the emotion in his work? The man is a genius with graphite. Is… is Tim Sale my favorite comic artist of all time? Well he’s definitely on the short list. To gush over Tim Sale’s art forever would be to indirectly besmirch Jeph Loeb’s story, and that isn’t acceptable at all. The Long Halloween is a fascinating story with a cast that is both enormous and entirely developed. Everyone has a distinct voice, a full personality, and a purpose in the book. There is very little wasted effort on Loeb’s part. There is a lot going on in this book, but it never feels too dense. Even with the mob feud and with Holiday and with all the rogues running about, the story also functions as a retelling of the origin of Two-Face, but it’s all seamless. The twelve volumes blow past as Batman puts his reputation as the world’s greatest detective to the test to solve the Holiday murders. Hell, there are interludes where Bruce Wayne spends some time under Poison Ivy’s control or goes on trial for connections to the Falcone family, but it all just flows and not a moment feels out of place. Loeb also takes time to put his stamp of ownership on several heretofore unimportant and minor Gotham City characters such as Sal Maroni and the extended Falcone family. It’s with Harvey Dent’s wife Gilda and C-list rogue Calendar Man where he really succeeds. Loeb’s Calendar Man borrows more than a little inspiration from Hannibal Lechter as he spends the comic locked behind glass in Arkham, taunting Batman with his own ability to have solved the Holiday mystery. He is powerful in his self-assuredness and devious in Sale’s rendering of him, but both manage to ultimately return him to his comical roots when he is wide-eyed and forgotten in his cell as he is left behind in a breakout of rogues. Gilda is a traffic figure, a woman who wants nothing more than safety for her husband in a city on the brink of collapse. She believes strongly in Harvey, even as she sees the metamorphosis in his ideals long before the acid ever reached his face. There are so many fantastic characters in the Bat mythos, and Loeb added two more to the list here with his renditions of them. Read the whole thing, obviously. I’m not fawning over Sale’s art and Loeb’s tale to say “Eh, it’s a’ight”. But if there is a particular high point, it might be the April Fool’s Day issue which sees Batman and The Riddler simultaneously following the clues and postulating who the killer is. As some of the strongest suspects are spun through, they are both left with a different ultimate guess. And when it ends with The Riddler coming up against Holiday, well… April Fools. Talking Point: Not that all comic artists have styles that “look the same”, but some are obviously more stylized than others. The Mike Allreds and Mike Mignolas and Tim Sales and Bruce Timms of the world, ya know? So which of these kinds of artists are your favorite? Who are some you don’t particularly care for? This is my favorite Batman story. 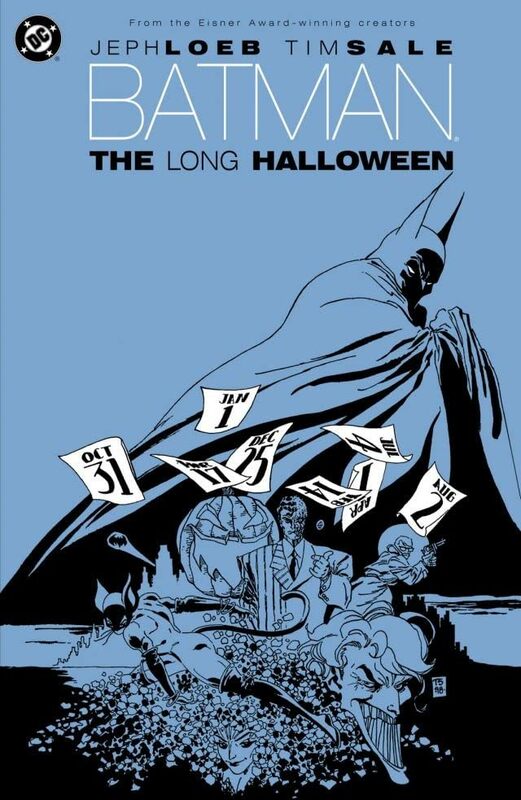 More than Year One or Dark Knight Returns or Court of Owls or whatever else, The Long Halloween is the Batman story I love the most. Loeb and Sale put together a master class on the Dark Knight here.